Keith & Alan's Movie News & Previews are again ready to bring the latest news from Hollywood straight to your eye/earballs, with previews, too! This year there have been some changes - our panel on Friday is earlier in the day, there is no Saturday show, and our Sunday show now starts after the Fandance Film Festival. Check out our new schedule! Friday - Previews Show #first - 12Noon-2pm - Grand 3 - Note earlier time! Sunday - Previews Show #last - 2-4pm - Evergreen 1-2 - Note later time! With no show on Saturday, Friday will be especially popular so get there early. See you there! Interested in Pathfinder Society Organized play? Not certain you want to commit to a full four hour session? Visit Table 18 in scheduled gaming and play a one-hour session to try it out. PFS will run extra sessions all-weekend based on interest. Want to play something but don't have that specific time available? Stop by to see what's available. Banquet tickets may be available at the info table, check and see. Size Acceptance is for Everybody has a new time 5pm THURSDAY instead of the previously published 9pm time. The membership guide has been incorporated into the guidebook and pocket program. Them’s the rules! Elton Elliott, Chris Pramas, and Jennifer McCreight have cancelled their appearances. Issac Marion is unable to attend this year, his reading scheduled for 11:30pm on Saturday will not take place. Saturday, Steve Savitzky in Concert has been cancelled. Due to a family emergency, Steve Savitzky will not be able to perform his scheduled concert at 7pm Saturday. We all hope Colleen feels better soon, and wish them both the best. Where in the world are Elton Elliott, Chris Pramas, Jennifer McCreight, and Issac Marion? Sign up at information, or just show up when we start. Two songs or ten minutes, whichever is shorter! Size Acceptance is For Everybody NOT at 9pm on Thursday. NEW TIME & LOCATION - 5pm Thursday, Cascade 5. Geek Trivia—what is this called in Pathfinder RPG? 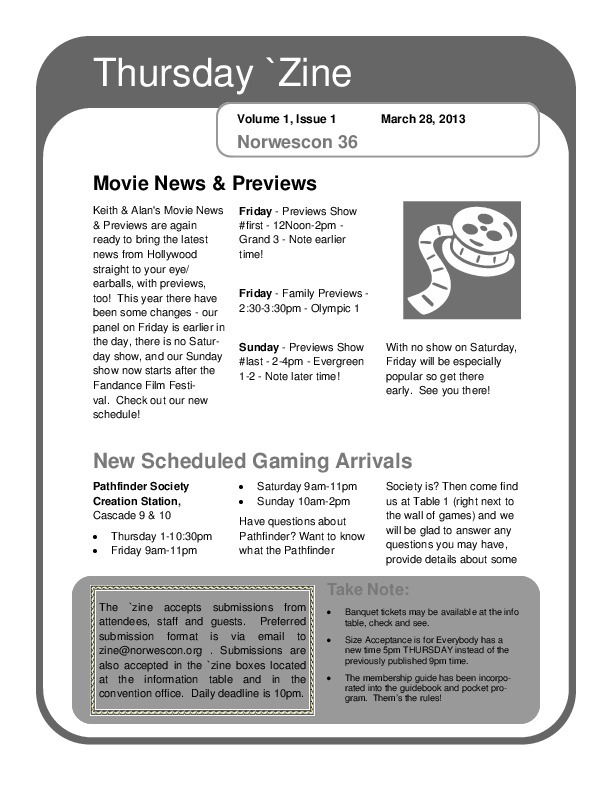 “Norwescon 36 Daily 'Zine (Thursday),” Norwescon History, accessed April 19, 2019, http://history.norwescon.org/items/show/182.